Yes, I know, Halloween was quite awhile ago... But that does not impede the love of all things colorful and sparkly! Like many nail polish aficionados, when I see a polish I like I will put it's name into a search engine and search for swatches and reviews. I appreciate seeing it in many different lighting situations, and also finding out what collection/release it's from. When Glam Polish had a sale on their limited edition polishes awhile back, I couldn't resist these two that I had been eyeballing for awhile. 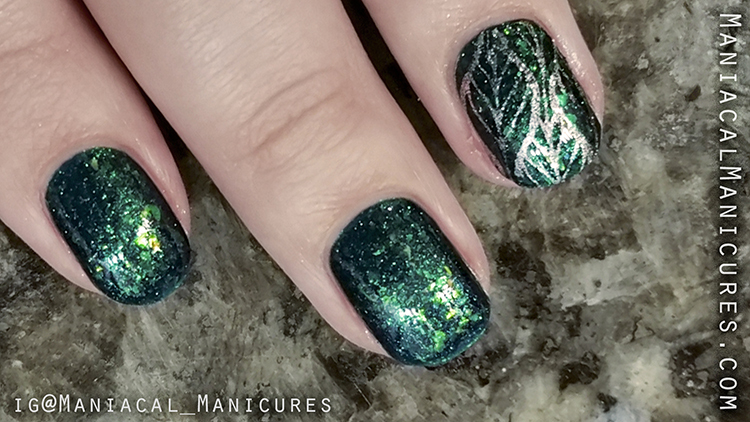 Alien is a dark green jewel-toned jelly with a heavy dose of iridescent green and copper flakies (I think I see some blue in there too). The base has a blue undertone, making this jelly lean towards turquoise, but it is unquestionably a rich green. The flakes vary in size, but there are enough larger flakes to really give dimension when the light catches them. Some of the smaller particles of flakes imitate glitter. I applied a basecoat before applying Alien, and I experienced a tiny amount of staining when removing it later. It is always recommended to use a basecoat, especially when applying a very saturated color such as reds, greens, turquoise, and blues. Since the polish is made with flakies, removal wasn't difficult nor did it take a very long time. Alien's formula is excellent with a good amount of coverage for the first coat. It is completely opaque in two medium coats, though one could add a third thin coat for added depth of flakies. As flakie polishes don't create spaces between particles as dramatically as glitter, only a single layer of topcoat should be sufficient to create a smooth surface. The color and shift of iridescence in the polish varies depending on your lighting. In ambient warm light, the flakies reflect more and the jelly base has a slight glow. In harsher bright light (such as fluorescent lighting) the polish appears darker and there is less depth to the flakies' sparkle. It makes for a fun polish because you keep checking your fingers in different lighting to see the effect. Alien is easily one of my favorite polishes because it is rich and dramatic! Below is two thin coats and with topcoat. Stamped design is from hēhē™ Stamping Plates Fairy Tale - 005 with Zoya Trixie applied with Creative Shop Stamper. 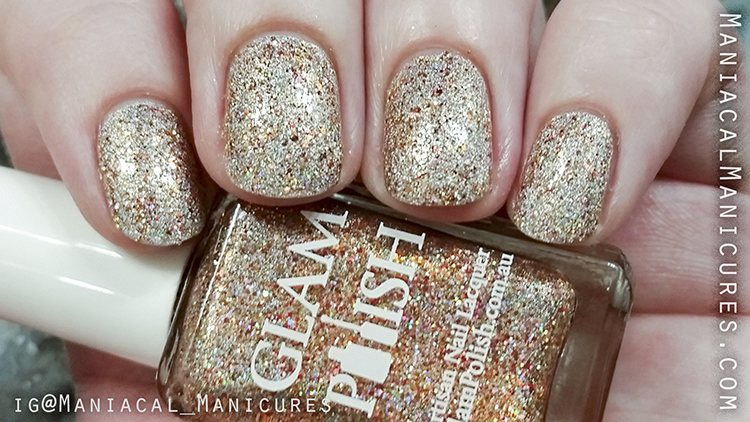 Fall'n For You is from the Halloween Trio, a primarily silver linear holo with a scattering of gold, copper/orange, pink, and rust micro glitter. There appears to be a golden shimmer to the base as well, making a usually cool-toned polish lean warm. I wasn't sure when I first swatched this on a swatch wheel if this was going to look good with my olive complexion. Despite being a complex mixture, the delicateness of it is a palette cleanser without being anywhere near bland. It was almost a one-coater, and hypothetically you could get away with one thick coat. I recommend two thin coats so you get the best dose of scattered color. 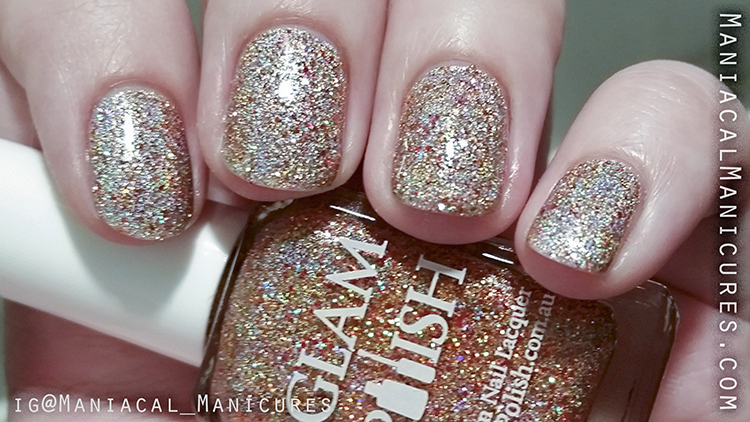 As this is a micro glitter, it will eat a bit of topcoat, so be prepared for 2-3 layers of topcoat. Removal was a little vigorous, so if you're looking for short-term wear, I'd recommend a peel-off-basecoat. Below is two thin coats and two layers of topcoat. Below shows manicure under light that shows more of the silver holo/glitter effect. And a quick video clip to show off the sparkle! 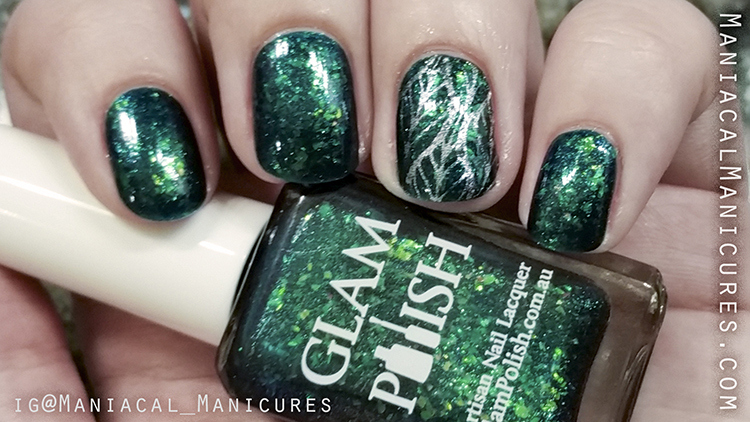 Glam Polish can be found on Facebook, Twitter, Instagram, Pinterest, and their Website.